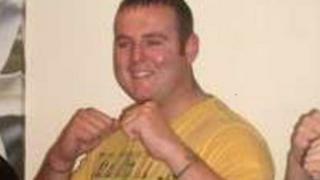 Police investigating the murder of Londonderry man Andrew Allen have issued a fresh appeal for information on the sixth anniversary of his death. The 24-year-old was shot dead at a house in Buncrana, County Donegal, by a group calling itself Republican Action Against Drugs on 9 February 2012. He was the first man to be murdered by the vigilante group. Five people have been arrested in connection with the murder, but no-one has been charged. The An Garda Siochana (Irish police) officer leading the investigation, Det Insp Pat O'Donnell, said he remains confident the "callous killers" will be brought to justice. "The people who admitted the murder, the group called RAAD, did so within 21 days of Mr Allen's death. We know who is in that group and we are actively investigating those individuals. "We are following several lines of enquiry and are very confident we will succeed in bringing the person or persons who committed this crime to justice." He urged anyone "with knowledge of what occurred that night" to come forward. "We are appealing today particularly to people on the periphery - girlfriends, brothers, sisters - and are asking those people who have a conscience to come forward and assist us with bringing these callous killers to justice," he said. Mr Allen, from the Waterside area of Derry, had been living at the house at Links View Park, Lisfannon for about six months when he was shot. His partner was in the property when the shooting happened but was not injured. A silver Vauxhall Cavalier was found burnt out a short distance away at Fahan shortly after the attack.